Thanks for your feedback on yesterday’s “10 Exercises to STOP Doing“. Since I had a lot of questions on what you can still do, I put together a list of replacement exercises. 1) First, just to clarify, you can still do Clean and Presses if you do the exercise properly with the right equipment. If you have any doubts about form, do squats supersetted with overhead presses instead. 2) You can also still do box jumps, side-to-side jumps, vertical jumps, etc. Again, just make sure all jumps are done with proper form and not to failure. Also, make sure your jump training is done on a wooden floor or grass, NEVER on concrete or pavement. Do dips with “a forward lean and with your hips and knees flexed roughly 90 degrees”. I use this exercise in the TT for Abs DVDs Advanced Workouts, and you’ll see proper demonstration in the manual and DVDs here. 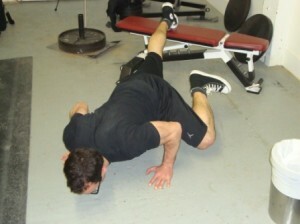 4) By the way, if you have bad shoulders, here’s a great exercise tip I found from Joe DeFranco. 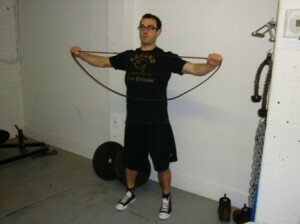 Joe recommends doing 100 reps of band pull-aparts every day. Do them in 4 sets of 25. Just hold a resistance band with your hands spaced shoulder width apart, and using light to moderate tension, pull the band apart by squeezing your shoulder blades together. I did 4 sets of 25 on Monday, and my upper back and rear-deltoids felt tremendous all day. I’m adding these to my warm-up routine at least 3 days per week. NOTE: You can also use the TRX or other straps for a lot of these better ab exercises. If you have the TT for Abs DVDs, you’ll be able to follow along with me as we do those exercises together in the comfort of your own home. …for you to read. They will make you a better trainer and keep your client healthier and fitter. If you’re a trainer and you don’t make an effort to read these books ASAP, I’d find that very disappointing.